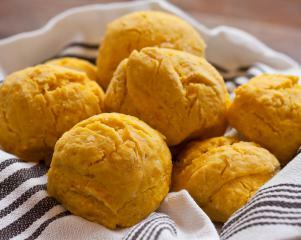 These savoury scones work well as a snack or on the side of a bowl of soup. Heat the oven to 200 C / 390 F.
Sift the dry ingredients into a mixing bowl. Blend together the pumpkin, soy milk and oil then add to the dry ingredient. Gently mix in until just combined. Turn the dough out onto a floured bench and fold together with your hands a few times. Roll the dough out into a half inch thick square. Cut into sixteen equal squares. Gently push the edges in to make each scone circular and place on a baking tray. Brush the tops with a little milk. Bake for 10 to 15 minutes in a hot oven (200 C/390 F) until the scones are a little browned on top.